The peepers started their call late this afternoon as I sat and prepared to write this newsletter, their siren call that beckoned me outside. 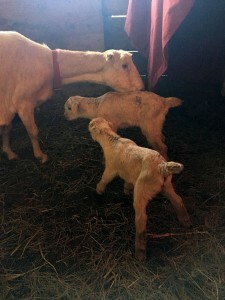 I put off writing to go out and bask in the promise of sunnier days while I enjoyed the frolics of our baby goats. Meet Ivy and Valentino, Calendula’s Valentine babies. We live sort of in the middle of the USA so our winters are pretty boring. We rarely get snow anymore that lasts for more than a day or two and generally, the accumulation isn’t even deep enough to have a snowball fight with. But even so, the grass and most plants generally die back with the exception of a few rebellious plants such as Motherwort, Catnip and Ground Ivy. They all tend to hang on. Even Monarda sprang back up pretty early, I think I first noticed her emergence in January when we cleaned out the herb gardens of their debris in preparation for this season. 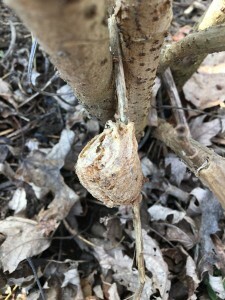 I counted 8-10 praying mantis egg cases which I safely located to areas around the garden. Praying mantis case nestled under the Elderberry. 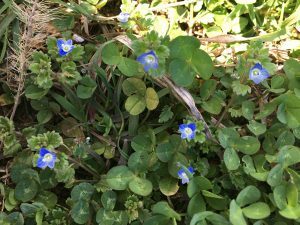 This afternoon, I noticed the Speedwell was blooming. This little plant is one I am guilty of overlooking in my herbal studies. It grows proficiently around here but for whatever reason, it’s never on my radar to learn about. That got me thinking, what makes a plant interesting enough that we want to study it? Why do we often ignore some plants? Why are some more ‘in favor’ and some more ‘out of favor’ to us? Speedwell AKA Gypsyweed, blooming among the White Clover. I decided to do a little research on Speedwell to see what I could find. Maude Grieve refers to Speedwell (Veronica officinalis) as Common Gypsyweed which intrigues me because I am very drawn to the Romany people. All of a sudden, I am very interested in this plant. Funny how a name can do much to stir an interest. Apparently Speedwell was a popular herb for a very long time. Well, I know an herb I plan to work more with this year! Sounds like a great plant for adding to our herbal first aid kit for skin issues! How about you? What’s in your back yard that you’ve been ignoring? I invite you to go out into your own back yard and make an inventory of the plants that are growing right now. Include the trees! I know that a lot of you living in a more northern climate may not have as much to see but try it anyway, you might be surprised to see what you can find. Chickweed and Cleavers have made their debut. If you don’t have any greenery popping up yet, refer back to your Herbal Bloom Wheel. What did you list on there last year that you might have discovered but never got around to learning about? What tree blossoms in your neighborhood that you’d like to get to know better? What about your landscape plants? There are a surprising amount of landscape plants and bushes that are actually medicinal in nature. You might be surprised to see what your yard has to offer. Don’t have a yard? What about your local park? You might be surprised to see what they have to offer. Make a commitment this spring to learn about 1 plant that grows near you that you’ve seen for years but never bothered to get to know. 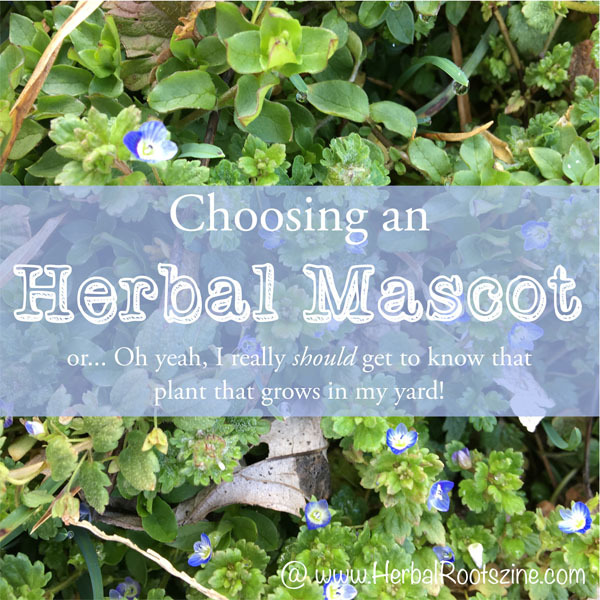 Adopt it as your herbal mascot for the year. To get you started, I’ve created a fun little printable worksheet. Use it in conjunction with my herbal profile template. Both are available for free on my website. I’d love to hear about the plant you decide to adopt for the year if you decide to do so. Please tell me in the comments or send me an email! 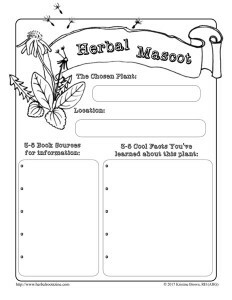 If you decide to post about it on Instagram, Facebook, Twitter or other online media, add in the hashtags: #2017herbalmascot #herbalrootszine so we can all see what we’re learning about this year! This entry was written on February 22nd, 2017 by KristineBrown and filed under Uncategorized.